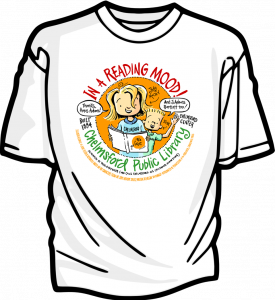 Show your support for the Chelmsford Library and Friends of the Library with this limited-edition t-shirt. The artwork was drawn especially for us by Peter Reynolds, CHS grad, illustrator of the Judy Moody series, and author/illustrator of many picture books including the Dot and Ish. The shirts are 100% heavy cotton, and all proceeds go to fund the Friends’ initiatives. If you’d like your order mailed to you (instead of picking it up at the library at no extra cost), first add your shirt(s) to your cart. Next, return to this page (look for the Continue Shopping link in the top-right corner of the cart), and click the blue “Have your order shipped to you for $5” button. Doing this will also prompt you to enter a shipping address as you check out. Please call us at 978-256-5521 with any questions!